The World Bank Group and the African Development Bank, with the support of the African Union, are producing a new ‘flagship’ report on how ICTs, especially mobile phones, have the potential to change fundamental business models in key sectors for Africa. The overall goal of this effort, which is known as eTransform Africa, is to raise awareness and stimulate action, especially among African governments and development practitioners, of how ICTs can contribute to the improvement and transformation of traditional and new economic and social activities in a number of sectors, including: agriculture; climate change adaptation; education; financial services; health; local ICT; public services; trade and regional integration; and ‘cross-cutting’ issues. Ensure that all investments in ICT in education (including those made by governments, development partners, and individual educational institutions) are – to the greatest extent possible – directed by a single, integrated ICT in education strategy so that they are working towards common national strategic objectives. Adopt a suitable global professional development framework to guide national implementation of ICT professional development. Consider judicious investments in content creation and aggregation to ensure compliance with African curricula, or local language demands, motivating usage by educators and students. Promote data-driven decision-making at all levels. There is much more to this report than just these lists, of course. The authors, who have extensive and varied experience working across Africa on ICT/education projects, have offered up much food for thought, and have referenced scores of interesting initiatives and programmes across the continent that may be new to many readers of this blog. Importantly, they note that, “in all instances, planning of new interventions aimed at harnessing ICT to improve education must begin with contextualised needs analysis and careful planning that takes account of the realities within which implementation will take place.” Such a statement might seem obvious — so obvious, in fact, that it should almost go without saying — but experiences with numerous projects across the continent over the past decade, some of which are referenced in the report, do suggest that more than a few folks need to be reminded of this very practical suggestion minimal requirement. 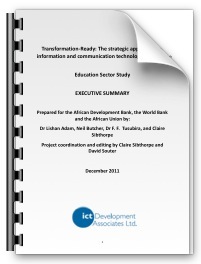 The full final draft of the eTransform Africa education report, and its various contituent parts (e.g. landscape analysis, case studies, etc.) available online as pdf documents on the eTransform Africa web site. Those of you pressed for time may wish to go directly to the 19-page executive summary [pdf]. Written by Michael Trucano on January 5, 2012 in Digital Learning Resources.